I knew we were in trouble when Mafouz hung up the phone. He looked at me, wide-eyed. Now my eyes were wide. View to Manger Square in Bethlehem, Palestine. Date unknown. Image from a private collection of slides donated to Cincinnati Christian University. News of the fire was disturbing for several reasons. First, it was disturbing because we were already rolling down the road toward the Bethlehem checkpoint with a bus full of clients. They had come a long way to see that church. Selling them on a Plan B would be tough (“Hey, how about cruising through some olive wood camel stores instead?”). Second, the news was disturbing because the Church of Nativity is the oldest sanctuary of continuous Christian worship on the planet (“So sorry, folks. I know the place has been here for 1,700 years, but it is gone now. You just missed it by a couple of hours!”). Third, the news of the fire was disturbing simply because of the weight of tradition attached to the place. 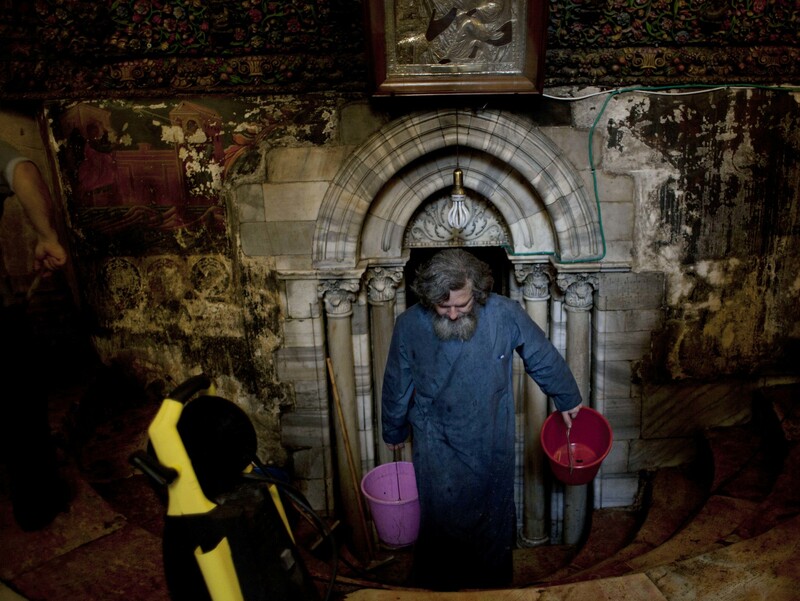 This is, after all, the spot where Jesus was born. If the manger stable was in cinders it would ruin a whole bunch of Christmas cards. The damage in the grotto. Image from here. “What happened?” I asked Mafouz. My mind raced in several directions at once. Could we go to another site instead? Was the whole church complex closed or just the grotto? How did this happen? Did it have anything to do with the recent visit of the pope? My mind lingered on this last piece. We had been running in the shadow of el-papa for several days now. Just two days before, Francis had visited the grotto. He had later spontaneously jumped out of his pope-mobile to pray at (against?) the concrete barrier that seals Bethlehem. Pictures of him leaning against this symbol of injustice were already becoming iconic. The Israelis were fuming. Bethlehemites were elated. 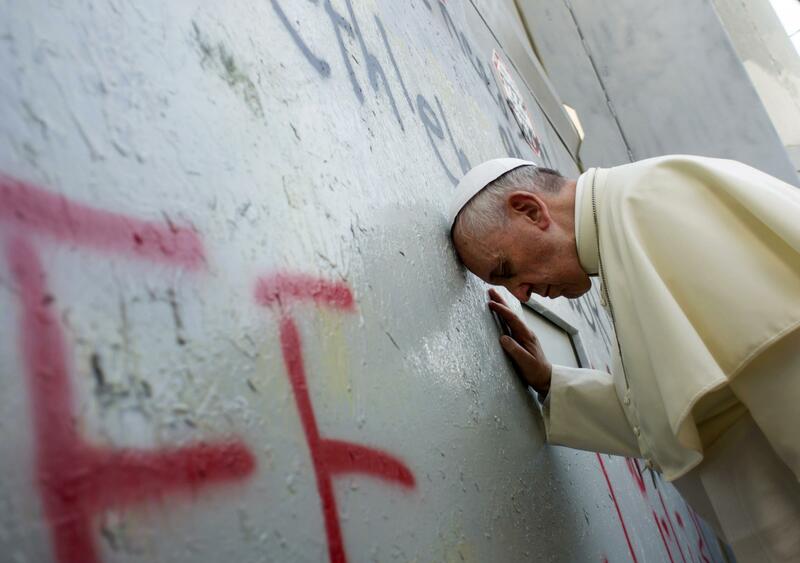 Pope Francis prays at the wall. The graffiti under his head in red letters reads “Free Palestine.” Image from here. I called a friend in Beit Sahour, an amiable lad named Iyyad. I have known Iyyad for years as a knowledgeable Palestinian guide. He confirmed the fire in the church and agreed to help. Special circumstances demand special people. We picked up Iyyad. When we arrived at the Church of the Nativity, there were many tourists clotting the courtyard of Bethlehem’s Manger Square. Iyyad deftly made his way up to the policeman controlling the entry and negotiated a priority passage for us. We bent down, one at at time, and crept through the church’s tiny entryway. Inside, the church was jammed with even more people. I looked around in amazement. It was not the fire that was overwhelming, instead, it was the renovation. The nave was wrapped in swaddling cloths; paintings, mosaics, rafters were tucked away, hidden from view. The church was receiving the first phase of an ambitious facelift. The Bethlehem nave is swaddled in cloths. It is an ambitious facelift. There was no entering the grotto either. Guards had closed the door. Workers were busy cleaning. Ongoing cleanup efforts. Image from here. We loitered about for a bit. A few from the group squeezed forward to see the altar area. When we were done, we exited through the same door we entered (no small feat, as the passage will only allow one person through at a time. All entering and exiting visitors were required to use the same portal because of the crisis.). It was a crowded and uncomfortable visit, but I was proud of our group. They took it in stride. The altar area inside the Church of the Nativity. Image taken on the morning of the fire. Image from Ron Vance. News reports later that day suggested a cause for the fire. Apparently, a burning candle fell from its stand in the early morning hours. The flame had ignited a tapestry that covered the grotto walls. Fire enveloped the immediate area, but soon burned itself out. The area is, after all, a limestone cave. Some priest likely caught some grief for the fumble. The candles are supposed to be extinguished at night. The reports should diffuse conspiracy thinking. Israeli retribution for papal prayers is absurd. Nonetheless, the rumor of a boogeyman continues to circulate.